“Do I want to go out to the ‘New Work’ in Brooklyn Park and teach Sunday School?” “No, I don’t think so,” I said to my friends and mentors, Don and Dorothy Gustafson. I was already teaching a tenth-grade girls’ class, which included a cute, little, chatty redhead, Elaine Westmark, and her friend, Margie Elliott. I really liked teaching that class. Also, my boyfriend, Will Rogers, was just home from the Marines and we were talking about engagement and a wedding. But Don and Dorothy kept encouraging us to come out to a meeting and finally we did. And we were caught up in the excitement of the dream and vision of a future church in Brooklyn Park. As the months went by, there were lots of meetings and lots of decisions to make. Should we build a parsonage and then we could use it for meetings and Sunday night services? Should we break ground for the church building shortly after? The time seemed to fly by. Charter Sunday came in like a lion but April was beautiful and we started to build—first the parsonage home on Tessman Drive, and then our church building. On Wednesday nights, we came in old clothes so we could help stain and paint woodwork, and then we changed and had Bible study, prayer, and coffee. We would always be a church where young people were important. We would have a strong emphasis on Sunday School. We would have a confirmation program. We would always be a missions-minded church. Our hearts were united on these points of ministry for Redeemer and they have been for 50 years. Look at the pictures and memorabilia on the timeline and you’ll see how our story unfolds. Our Confirmation program drew families from all over the Twin Cities into our church life. Youth Choir ministered to our youth and to those wherever they performed. All of it—Sunday school, confirmation, missions—you are looking at the culmination of 50 years of the “New Work.” You are seeing the results of people’s love for the Lord and for all who came in our doors. We added on buildings over the years because they came hungry for God, and we made room for them. And people still come to Redeemer. They come to us hungry for God and fellowship and comfort. So for the next 50 years, be ready to share Jesus Christ with all who come in the doors of Redeemer and be ready to love them and teach them and comfort them because this will always be God’s “New Work” in Brooklyn Park. Remember when the cold winds of January brought the 24-hour prayer vigil? We always signed up for the middle-of-the-night when we had teenagers. It was easier for us than families with young children. I remember waking our children and making our way to church in the dark of night for prayer. It was National Prayer Week for the Covenant and we held our prayer vigil during that time. We waited just outside the Memorial room for our turn, and that way the chain of prayer was not broken. There was only light from the fireplace and candles as we each found a place to kneel and pray. It was never comfortable coming out in the middle of the night, but God has always been so faithful to Redeemer that for one 24-hour period we could be faithful to Him. January has always been the month in Minnesota you just want to “get through.” Not at Redeemer Covenant Church because January brought School of the Bible. This was an exciting time for us. As the holidays drew to a close, we contemplated what class we would sign up for. There was usually a choice of two or three short courses taught by professors from Bethel and Northwestern Colleges. Now we also had a spaghetti dinner just before we started. One year when Arne and Mae Stolberg were in charge of the supper, they decided to have chow mein instead of spaghetti. Mae and Arne went over to the Bamboo House to check out prices. They inquired about chow mein for 300 people. The young girl looked at them with her eyes wide. “Tonight?” she said. We laughed about that for years. The chow mein didn’t go over very well so the next year we went back to spaghetti. School of the Bible made each Sunday night one of anticipation, and the coldest month of the year passed quickly by. Youth Winter Retreat – A Redeemer Tradition! I can remember as soon as I was in the seventh grade being excited because I could go to winter retreat. That was the feeling for a lot of the youth, I’m sure, growing up at Redeemer. This was a weekend to spend with your friends and get away for some winter fun. When retreat started, it was held at Camp Courage. Friday night, we would load the busses and head on out for a fun weekend. Once we arrived, the buses were unloaded and then it was time to find your cabin. For girls, the challenge was to walk to our cabins without getting pushed into the snow bank by the boys. The boys’ cabins were always first along the path so it was very convenient for them to accomplish this. The weekend was filled with lots of activity. We looked forward to hearing the speaker the first night as he introduced what was to be spoken about the rest of the weekend. During free time, there was a broomball tournament, swimming, and gym time. Everyone who wanted could play broomball: all they needed was an old pair of tennis shoes or boots and their mom’s old broom, wrapped with tape. Each grade level had a team, made up of girls and boys. There is the unforgotten year that the 9th graders beat the college-age group; Jim deWeerdt can confirm this. To this day, broomball is still a favorite activity at retreat. At Camp Courage, we also enjoyed using the swimming pool and sauna. After sweating in the sauna, the challenge was to run outside, roll in the snow, then jump back into the pool to warm up. The highlight of the weekend was the Saturday skit night. These were presented by cabins or grade levels. We had some very talented people, or should I say creative people! Winter retreat was a lot of fun but it also gave youth time to look at their personal walk with Christ. It was a chance for lives to be changed: to recommit your life and even be a witness to friends who came for the fun and were introduced to a life with Christ. It was, and still is, a time to worship with great music and singing. There have been many good speakers through the years. There was one particular year that I’m sure many will remember when it was set up ahead of time that the bus would stop and pick up a hitchhiker along the way to camp. Only a few knew what was going on. By now, retreat had been held at Covenant Pines for some years. So along Highway 65, the bus picked up this man who looked very scruffy, dirty, and kind of scary. I’ve been told that the bus grew very quiet, with only soft whispers heard. That evening at camp, the man got up and spoke. The youth were kind of questioning his character until they were told who he was and that he was actually their speaker for the weekend. Does anyone remember who the speaker was? Well, I could go on about how important retreat was, and still is, for the youth of Redeemer. It is nice that the youth of a couple other sister churches join as well. I think of all my memories at retreat and I am so thankful that my children were able to experience retreat as well with great memories. As I close, I would like to say thank you to the counselors who have served and made retreat special for the youth. I hope that the tradition and importance of winter retreat continue on so that they may continue Growing the Dream here at Redeemer. From its first beginnings, the founders of Redeemer Covenant Church had a plan to make the Gospel of Jesus Christ the center point of their message. They knew that the teaching of the Gospel, God’s Word, was paramount in their purpose and essential to what God had called them to do. So, to teach Scripture is to teach Christ and the new church took every opportunity to do so. Early on, they started Sunday school classes. At first, they developed Sunday school programs for the younger children and then adult teaching as well. Some of the first teachers were Arnie and Mae Stolberg, Dorothy and Don Gustafson (who the Memorial Room is dedicated to), Willis Rogers, and Bert Johnson. Does anyone remember Edith Mellon’s Bible verse memory program for children before AWANA became an essential part of the church’s children’s teaching and outreach? As the church grew in attendance, Sunday mornings became vibrant and packed with new people eager to be in God’s house and learn about Him. People volunteered their time for service because the church had a growing need for key leadership positions. One such person of dedication was Carole Metcalfe, who for 20 years was the Children’s Sunday School Superintendent. Such dedication was a hallmark of devotion to the calling of Redeemer as a church. During the mid 80s, there was a period of time when Sunday school attendance was nearly 700 strong and our 5th and 6th graders were bused to North Hennepin Community College because we simply could not handle the numbers of people attending Sunday School. Our very own Eileen Mechtel drove a school bus to and from the college every Sunday. The bus company was owned by a Catholic family, and they never charged us for use of the bus. Some of the dedicated people who are still here at Redeemer and served long-term and devoted themselves to this Christian education effort include Vone Bosch, Rod and Donna Salo, Julie Laudal, and so many more. One of our pastors developed a format for a three-year confirmation program that was put forth as a standard for confirmation throughout the Covenant denomination. It has been a drawing point to Redeemer for people all over the area. Confirmation has provided young people in their teens with a firm foundation for their faith in Jesus. It is truly one of the finest “discipleship” programs ever implemented here at Redeemer. In more recent years, the adult ministry program called “Discipleship University,” or DU, has provided a broad-based biblical teaching of the Gospel to strengthen and encourage our adults in their faith walk. Many devoted teachers and pastors have contributed to this successful, ongoing program. Yes, Redeemer has met the call to Christian education as God has directed and we look forward to his continued blessing and guidance. I still remember how exciting it was to meet with all the women in our new little church and organize “The Women’s Guild.” One of our first big activities was to have a Christmas smorgasbord. Little did we know this would become a favorite night for the women and would go on for fifty years. When the multipurpose room was built, we spread out down there and sometimes numbered 300 and more. “Home for Christmas” was in 1983. We decided to have a hostess for each table and we brought our glassware and decorations from home. Scandinavian food and decorations covered the hallways and tables for the “Festival of Lights.” Dala horses and straw goats peeked out at us as we made our way to dinner. “A Victorian Christmas” brought us Madrigal singers and music on an antique pump organ during the punch hour. Our Victorian dinner included rock Cornish game hens. I remember washing 150 hens and cutting them in half to get them ready for cooking. It was a long time before I could look at Cornish game hens. For dessert we had flaming plum puddings. Our speaker, former Miss America Vonda Kay Van Dyke was very impressed. 50 years of Covenant Women’s Christmas dinners when we could bring neighbors and sisters. A magical night for women when we can forget about the trappings of the busy holidays and think on the real meaning of Christmas. May the tradition continue for another 50 years! When the Covenant Church was started, it was known as Swedish Mission Tabernacle. The aim of the Covenant was missions. Brookdale Covenant Church also had that vision and started Redeemer Covenant Church in 1962. 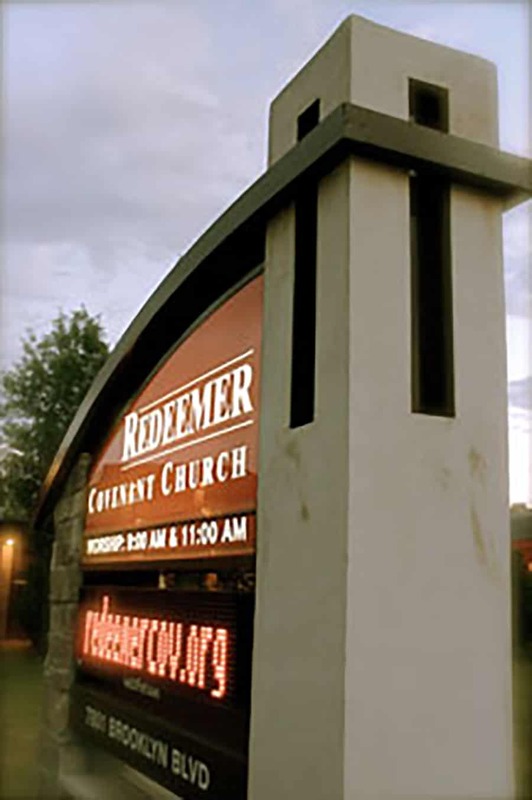 Redeemer Covenant began a work at Maple Grove Covenant Church in 1987. So missions have been a key in our church heritage. Six months after we started our church, we had our first missionary conference, which was held for one week each fall. We had speakers from Congo, Japan and Ecuador; and every year following, we had a mission’s conference. Bonnie Berg Eng was our first short-term missionary to Ecuador and Linda Hallblade followed her for a year. We have had many students serve in summer ministries. They have served in Alaska, San Francisco, Texas, Chicago and Mexico for as long as a year. Career missionaries have also been from our church. Currently, we are supporting eleven career missionaries who are serving in Mexico, Thailand, Japan, Sudan, Colombia, Chinese ministries, and those with The Navigators, Campus Crusade for Christ, Alaska Christian College, Shelter Ministries, and Under His Wings music ministry. We have sent teams of people to Mexico, Jamaica, Texas and Alaska to do service projects. We have eleven pastors serving from our church and six others who were affiliated with our church through youth groups. We have always considered our neighbors as our mission field. Our home mission was started by Don and Dorothy Gustafson, who involved all our young people in children’s church and youth activities, including camping, canoeing and home get-togethers. Our college-age Sunday school classes were held in homes and the parsonage. God has blessed us with willing workers to gather His harvest. To God be the glory!